Blue Note, Milano - October 31st 2004 - 10.00 p.m.
Jane Monheit and her touring band are at their last evening at Milano tonight after a a sequence of concertes held at Blue Note, and even though they've been playing for days now, the concert room is filled with people that have come to listen to this rising star's concert. In only a few years Jane Monheit has become very popular; she is presenting her fourth cd, and has a wonderful curriculum, which she can be very proud of. Before the concert, Alberto Gottardelli and I meet Jane Monheit for a brief interview. After the interview, we sit at our table, directly in front of the stage, and at 10:00 p.m. the concert begins. Rick Montalbano - Jane Monheit's husband (drums), Michael Kanan (piano), Orlando Le Fleming (double bass), Miles Okazaki (guitar) and Jane Monheit take their places on stage. Jane Monheit looks glamorous, her dark, long, thick, wavy hair dancing under the lights and her figure enhanced by an olive-green top that leaves her shoulders bare. 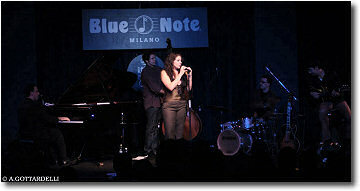 Jane Monheit and her touring band are at Blue Note to introduce their last CD issued by Sony: "Taking A Chance On Love". The first song Jane sings for her audience is the song that titles her latest cd: "Taking A Chance On Love". It is outright clear that she is very gifted and talented. Her pitch is perfect, she's very precise, and she uses dynamics knowingly in order to convey her most intimate feelings, apart from having a wonderful swing. On stage she looks very confident, and she adopts the gestures and attitudes of the great divas of the past. The next songs are "In The Still Of The Night", "Honeysuckle Rose" by Fats Waller, that starts off as a bass and voice duo and continues with the whole band that comes in after a few bars. Jane and her band receive a warm applause and cheers after each piece they play. The next pieces are Brazilian songs: "No More Blues" (Chega De Saudade) by Jobim, and "Remember Me" (Ivan Lins). Her voice is fresh and seductive, and she sings flawlessly and with no apparent effort both the ballads and the swingier and faster-tempo songs. Jane adds colour and depth to her interpretation by a knowing use of dynamics. We listen to two other songs before a short interval: "Why Can't You Behave" and "Old Black Magic". After the break, the concert continues with "Wave". Jane sings all the Brazilian songs with English lyrics. The evening goes on with "Cheek to Cheek", "Tea For Two" in duo: piano and voice. Michael Kanan accompanies Jane Monheit with taste: this intimate version of the song in duo is very beautiful. After this, Jane sings "I Won't Dance", a song which is sung in duo with Michael Bublé on her new album, and "Love Dance" (Ivan Lins). 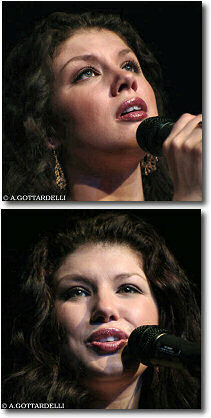 Jane Monheit tells the audience that "Love Dance" is one of her favourite songs. The last song is "Lover Come Back To Me". Jane Monheit introduces all the musicians of her band, one by one, and then signs a few autographs with a smile to young fans that reach out with their cds. Cheers and applause follow, and won't stop until Jane Monheit reappears on stage with her band and sings a very touching version of "Somewhere Over the rainbow", singing the first part of the song a cappella.